Big data is an evolving concept that refers to the growth of data and how it is used to optimize business processes, create customer value, and mitigate risks. A key contribution of the Desouza report is his descriptions of how big data is being used in federal, state, and local government today. His examples include the Internal Revenue Service, the state of Massachusetts, and the New York City Business Integrity Commission. Over the last year, Professor Desouza conducted extensive interviews with chief information officers (CIOs) across the United States at the federal, state, and local level. The goal of the interviews was to better understand the implementation challenges facing CIOs and their organizations as they undertake big data projects. Desouza presents 10 key findings from his interviews. He also presents detailed descriptions of the three key stages in implementing a big data project: planning, execution, and postimplementation. 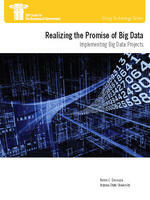 This report continues the IBM Center’s interest in the concepts of big data and analytics. In cooperation with the Partnership for Public Service, the IBM Center for The Business of Government recently issued its third report on analytics: From Data to Decisions III: Lessons from Early Analytics Program. The use of analytics in agency program management and decision-making relies on big data. Collectively, this report and the Partnership-IBM Center’s three reports on analytics provide a roadmap for federal leaders on how to move to the new era of big data and analytics. We hope these reports will assist all public managers as they continue their quest to better use data that they collect on an ongoing basis. Read the Wall Street Journal's blog. Read the Government Executive article. Read the Federal Computer Week article. Read the translation of report highlights in Chinese.